To begin a journaling routine is simple. 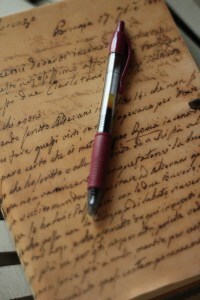 All you need is something to write with, something to write on, and a desire to write. You can easily start with supplies you already have on hand: either a computer or tablet with word processing capabilities, or if you prefer the old-fashioned way, pen and paper. However, I would advise experimenting with a variety of supplies to decide which method works best for your writing style. spiral bound notebook: these come in college or wide-rule, are easy to find, inexpensive, and lie flat for easy writing on either side of the page. composition notebook: these tend to be wide-ruled, also lie flat for easy writing, and are equally easy to locate. They come in either a hard cardboard cover or softcover, and cost slightly more than the spiral bound. I prefer the softcover because I can fold the notebook in half and write on my lap if necessary. Most of my journals are this style. moleskine notebook: these popular notebooks come in a variety of sizes, soft or hard cover, with either blank, ruled or graph pages. While these journals are a bit more pricey, I believe they are worth it. I use the ruled 5 x 8.25 Volant, and love the narrow lines. may designs: similar style to the moleskine, these journals allow you to customize colors and personalization. These are great for a special occasion journal. They occasionally offer site-wide sales, so be on the lookout for Black Friday specials. Visit May Designs. leather journals: or any other decorative style journal found at stationery shops. I can look at journals for hours, and develop a wishlist a mile long. There is one caution I would give: don’t select a journal considered “so precious” that you are fearful to write in it. I speak from experience. Treat yourself if you want… but be sure to use it. Aside from the paper, there is also the pen. I would advise using a pen rather than pencil because the writing will not fade as quickly. In addition, the pencil tends to awaken the inner editor. If the eraser is available, you will focus on writing “right” rather than writing true. Be bold… use pen. PENS: Here is a list of a few possibilities. ballpoint: these are easy to find, inexpensive, and come in a variety of colors. I tend not to use ballpoint, however, because they don’t write “smooth” For some, this is not an issue, but when I get in the writing zone, I want my pen to glide across the page. pilot G2 gel: when I started journaling, I researched the most popular journaling pen. This one fit the bill. It is smooth, does not bleed through the page, easy to find, and comes in a variety of colors. I LOVE it. Uni-ball: another popular pen with some journalists. I don’t think it writes as smooth as the pilot, but that is personal preference. I also think the color selection is limited. felt tip: while these come in a wide variety of colors (even more so than the pilot) and are easy to find, I don’t think they write smooth AND… more importantly… they tend to bleed through the page. I prefer to journal this old-fashioned way. I like the physical movement of my hand across the page. I enjoy forming letters with the pen; it is my personal means of creative expression. Handwriting makes me slow down, process what I am writing, dig deep, and expand my thoughts to consider other possibilities. I realize there are times when writing on a computer is preferred, and I will cover this topic next week. In the meantime, take yourself on a shopping trip. 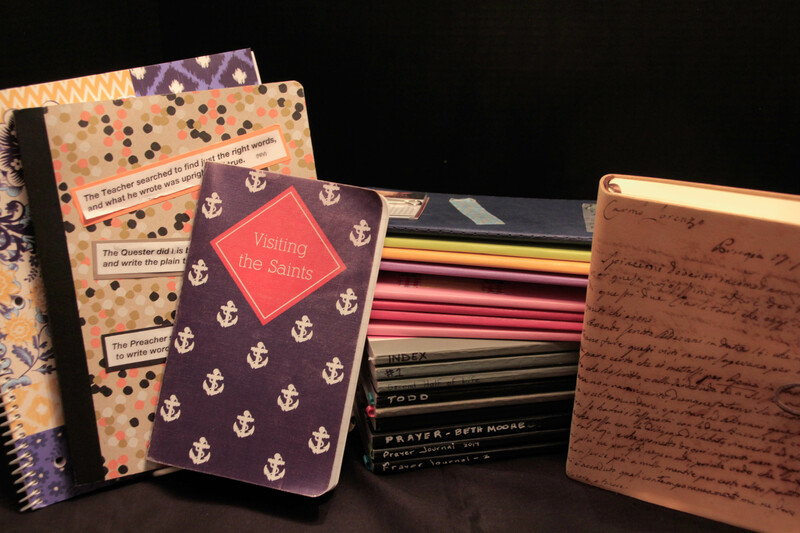 Find several different styles of journals, a few different pens, and go home to experiment. I’d love to hear which products work best for you. I do my journaling on a computer, using The Journal 6, however when writing in longhand, I LOVE gel pens. 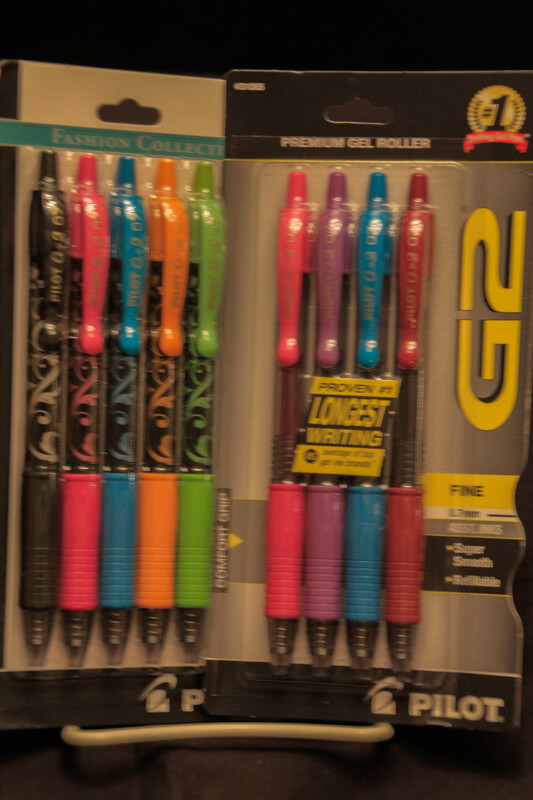 I love the Pilot Gel pens, too, and buy a big pack at Costco – with lots of color choices.